You know, the more I study football kit history the more I appreciate just how big and far-reaching the effects of the Admiral mid-70's kit revolution were. The kit they produced for Aberdeen back then, worn just as the club were beginning a golden era under the managerial reign of a certain Alex Ferguson, is a fine example. Prior to 1976, The Dons had enjoyed a succession of relatively plain and simple red kits. Nothing wrong with that of course, but Admiral’s bold approach, born from a need to produce copyrightable designs that could be subsequently sold as replicas and inspired by the ever increasing role of colour TV in the football world, lifted the ordinary Aberdeen kit into something extraordinary. It was the simple addition of five (or occasionally four as, in true Admiral fashion, the finer details did vary) thin vertical stripes all grouped together on the left hand side that really made the kit stand out. The fact that these stripes then continued on the shorts raised its kudos even higher. And that was it. That was all the kit required. No concepts, no symbolism - just the beauty of pure aesthetics. Hell, it was so good, it didn't even need a club badge! But whether it was being worn in a football stadium or the local rec, it was unmistakably Aberdeen, no doubt about that. 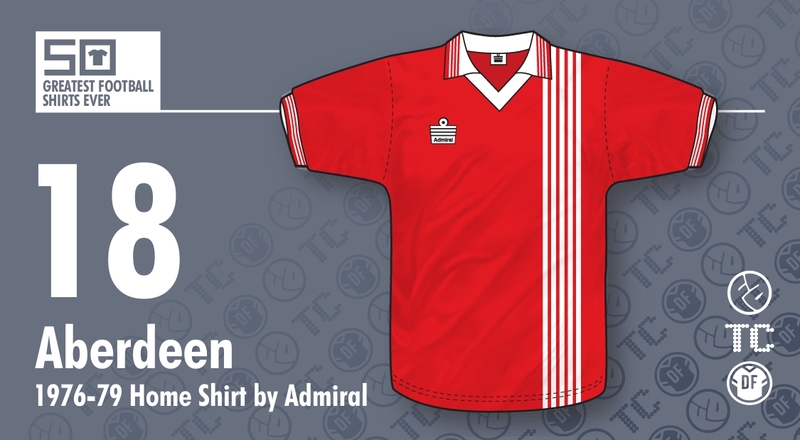 A few other clubs also sported this design but none of them wore it quite as well as The Dons and is fondly remembered by Aberdeen fans of a certain age. The fact it was donned (ahem) in a couple of vital and formative cup finals en route to Fergie’s prime at Pittodrie seems only fitting.